Already own your own home site? Already found your perfect lot? We’re ready to build and make your dream home a reality. There are many things to consider when building on your own lot – clearing the lot, positioning of your home on the lot, sewer and water services, permitting and inspections, and much more. 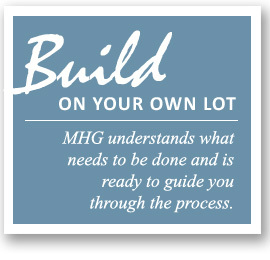 Whether you are just starting to think about building and searching for the perfect lot, or if you have already purchased your site and are ready to build, the experts at MHG understand what needs to be done and are ready to guide you through the process. Choose Your Lot from a selection of lots available to us, or we can help you find a lot. Choose Your Plan from a plan you have, one of our plans, or one we design together. We will give you an initial cost estimate based on the chosen plan, elevation, and fit and finish of your home. We can price any additional plan features or upgrades that you desire. As with any home building project, there may be certain restrictions or requirements associated with your lot from city, county, or community associations. These restrictions may result in additional construction requirements which may add to the overall cost. Make Selections from our internally developed selection templates which outline what decisions are needed at each stage of construction to complete your home on time. Our selection templates are customized to your home and include a budgeted allowance for each item. You’ll work directly with our interior designers and preferred suppliers, who have extensive experience in helping customers choose the finishes that turn their visions into reality. Contracts will be drafted and signed that outline a construction time line, budgets and a draw schedule so there are no surprises for you, us or the lender. Construction will begin and the construction time will vary based on each plan and home. 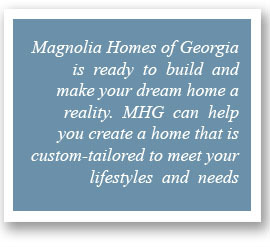 We will guide you through the entire building process and establish a schedule of meetings between you and MHG. We will use our industry relationships to negotiate volume pricing on materials. We monitor and manage our jobs closely, ensuring the work is completed on time and to the exacting quality standards we are known for, keeping open lines of communication throughout the process. Our relationship doesn’t end once you move into your new home. We provide a home warranty and also provide superior customer service to address any questions you may have after closing. Consult with MHG by e-mail or phone to discuss your needs and arrange a time for a consultation.